Department of Commercial Taxes, Government of Rajasthan (Rajtax) has released answer keys of written exam Paper 1 and Paper 2 which was conducted successfully on 25th January 2015 for 182 Posts of Tax Assistants in various departments of DCT, Rajasthan. The latest news is that official answer keys/ Paper Solution has been released for calculation/ analysis of performance made by the candidates in the written examination. The official answer keys of Paper 1 and Paper 2 has released on 10th February 2015 along with objection form on Answer keys. In case any candidate has any objection on the answer keys of Paper 1 and Paper 2 can sent objection form duly filled in legible handwriting by marking problem on hard copy of answer sheet to the address Department of Commercial Taxes, Ambedakar Circle C-Scheme, Jaipur Rajasthan via registered post or speed posts between 10th February 2015 to 17th February 2015. The cut off is expected to be high as thousand numbers of candidates had appeared in the exam who had made self-preparation or prepared by many coaching institutes. 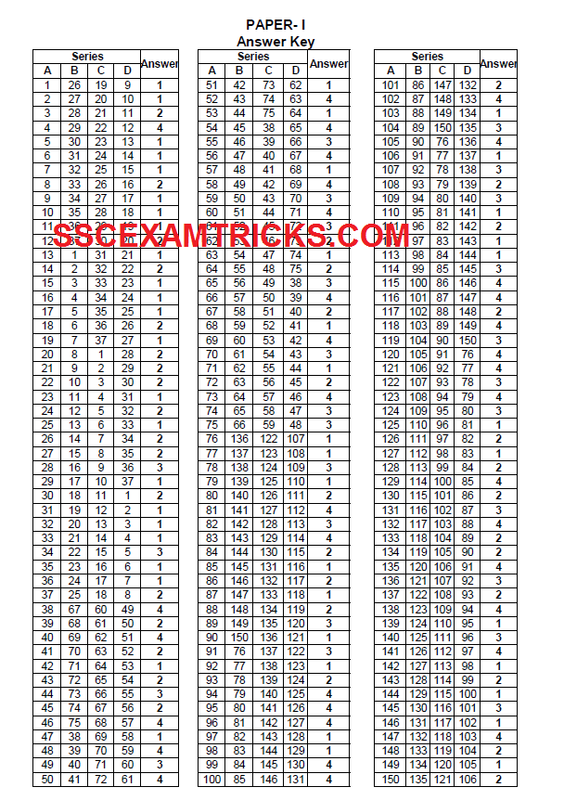 Those candidates who had appeared in Rajasthan Tax Assistant Exam 2015 and waiting for Rajasthan Tax Assistant answer keys 2015 to match their answer delivered in the written examination, can download official answer keys from the direct link provided in the end of post. The written exam was conducted on 25th January 2015 by Pen Mode in which OMR sheet was provided to deliver answer by darkening circle on it by Blue/Black ball point pen. The written exam was consisted of two papers i.e. Paper 1 & Paper 2. Each paper was of 3 hours. The Paper 1 exam was a multiple choice question paper containing General Awareness and English & Hindi Language questions of 100 marks which were required to be completed within time limit of 3 hours or 180 minutes. The Paper 2 exam was a multiple choice question paper containing Reasoning & Quantitative Aptitude (Arithmetic) questions of 100 marks needed to be completed within 3 hours or 180 minutes. The minimum qualifying marks was 40% marks for Paper 1 and Paper 2.